The outline of the over 7,000-word proposal was presented by Prime Minister Alexis Tsipras in an address to his parliamentary group on 30 October, and the main issue that was left open was the provision for the election of the President of the Republic by Parliament. 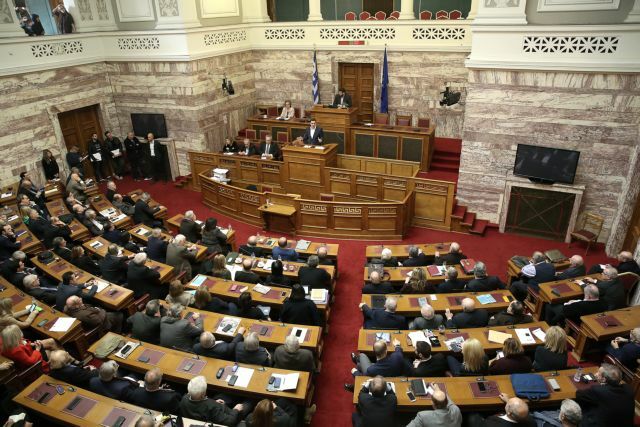 The ruling SYRIZA party is tabling in parliament today its comprehensive proposals for the constitutional amendment process, amidst criticism that it has not sought the consensus required for a revision of the country’s basic law. The outline of the over 7,000-word proposal was presented by Prime Minister Alexis Tsipras in an address to his parliamentary group on 30 October, and the main issue that was left open was the provision for the election of the President of the Republic by Parliament, in as many as six consecutive votes over a six-month period, which was roundly criticised by the opposition. The aim here is to avert the dissolution of parliament when the two-thirds majority currently required to the elect the head of state in the first three votes is not secured, so as to ensure political stability and prevent the e election process from being used to trigger early elections, as SYRIZA itself did in 2014 and previous governments had done as well. The effort to minimise the constitutionally guaranteed embrace of Church and State has also drawn criticism, though it does not go as far as a complete separation, as some in the left-wing party are demanding, as a full-blown clash with the Orthodox of Greece (which is described as the country’s prevailing religion in the constitution, which begins with an invocation of the Holy Trinity in the preamble). SYRIZA is already collecting the signatures of the at least 50 MPs required to launch the constitutional amendment process, which will amend 23 articles of the Constitution of the Hellenic Republic. These include Article 3 (concerning the prevailing religion and the religious neutrality), Article 13 (regarding the abolition of the currently optional religious of office in favour of a mandatory civil oath), Article 21 (regarding the protection of society and guaranteeing a dignified standard of living for all citizens), Article 22 (concerning the protection of labour and of the terms of employment), Article 28, (which will add a provision making referendums much easier to hold), Article 32 (regarding the process of electing the President of the Republic. In order to avoid the dissolution of Parliament after a failure to garner the two-thirds majority in the first three votes, the amendment provides for up to six monthly votes thereafter), Article 37 (regarding the PM’s capacity as MP), Article 84 (regarding parliamentary trust in the government), Article 54 (concerning the proposed directly proportional electoral system and allowing diaspora Greeks to vote for their own MPs, who will represent them specifically), Article 56 (regarding a three-term limit for MPs), Article 62 (regarding the process of lifting parliamentary immunity), Article 73 (regarding the right to table draft legislation), Article 86 (to extend the currently extremely brief statute of limitations on crimes committed by sitting ministers), Article 101A (regarding independent authorities), and Article 102, (concerning direct proportional representation in local government elections).